It’s a time for happiness and festivities as the Lunar New Year, ‘Seollal’, is just around the corner in South Korea! 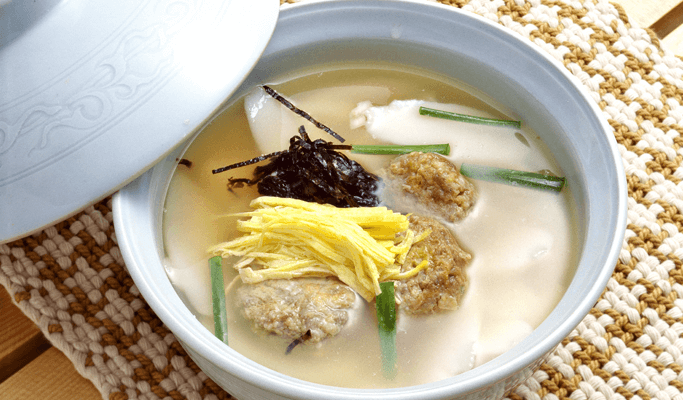 Seollal, which is considered a major holiday season for the Koreans, usually lasts for 3 days. 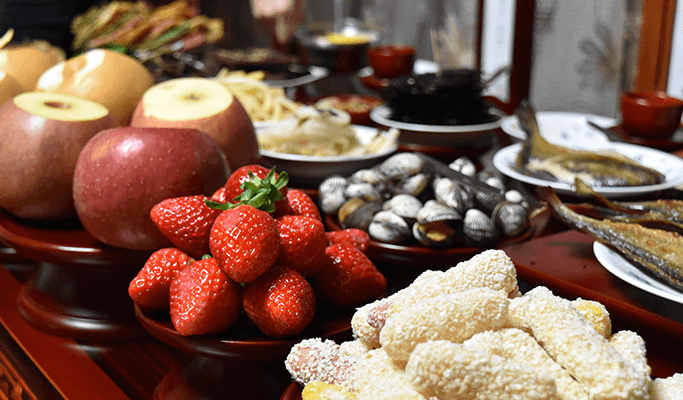 During this period, most of the shops and restaurants will be closed, especially on the official day of Seollal (February 5th, 2019). So, keep that in mind if you’re planning on visiting South Korea during the month. Major palaces, museums, and amusement parks are open, but do double check the websites to check one more time before you go! Various traditional events and cultural performances will be held at tourists sites for visitors, so there are still many fun things to do during this holiday season. Of course, there will be a heavy traffic jam and it’ll be very difficult for travelers and tourists to purchase a train or bus ticket. To avoid the insane crowds, refrain from traveling to other provinces or regions around South Korea during this period! Then, how do we celebrate Seollal? Let’s find out! 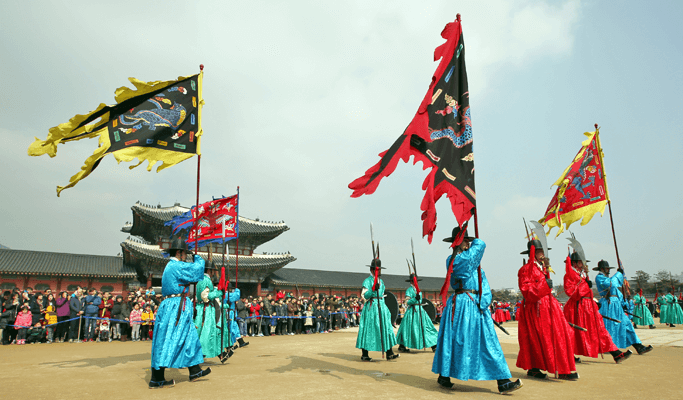 During Seollal, you might witness Koreans wearing a beautifully colored and patterned Korean traditional dress called ‘hanbok‘. It is not mandatory to wear, but nowadays, wearing ‘hanbok’ is becoming a popular fashion trend in Korea. If you’re interested in renting or trying out Korean traditional dress for a day, click here. In the early morning of the official day of Seollal, all the family members and relatives gather and begin an ancestral rite and preparation of a process called ‘charye‘. All family members together prepare dishes of ritual foods and set them on the table. After the table is set, they (in the order of oldest to youngest) stand in front of the table and bow to the spirits of the ancestors first. Watch the video below to see how ‘charye’ is done! Now, this is the exciting part! 🙂 Family members take turns (from the oldest to the youngest) and give a deep bow to the elderly and parents. Koreans call this bowing process ‘sebae‘. After the bow, parents or relatives will then give the children money or ‘sebaetdon (New Year’s money)’ and words of blessing in return for the New Year. 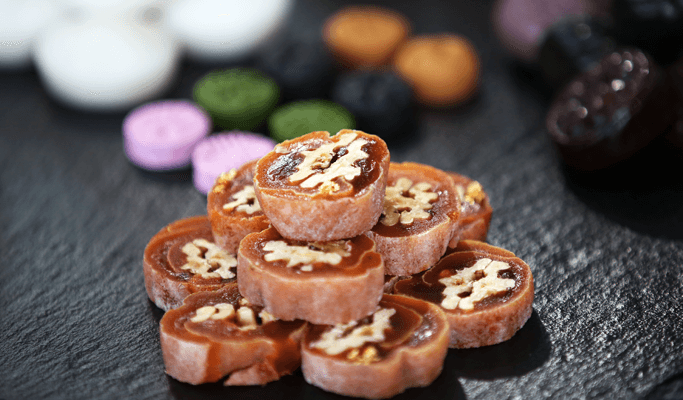 Try other Seollal foods as well like ‘sanjeok’ (meat and vegetable brochette)’,’buchimgae (Korean style pancake)’, and Korean traditional desserts like ‘yakgwa(honey cookie)’, ‘hangwa (traditional Korean sweets)’ and ‘injeolmi (rice cake covered with bean flour)’. 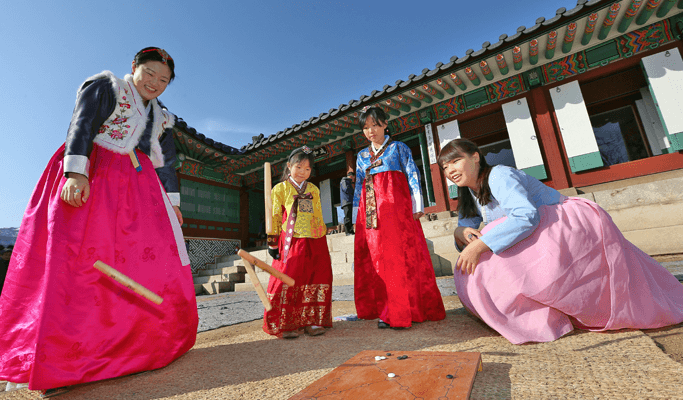 Seollal is a perfect time for families to play some fun games together! The most popular traditional game is called ‘yutnori‘, which is a board game. It’ll be much easier for you to understand the game if you think of it as ‘Monopoly’, where you throw four wooden sticks instead of dice. Other fun games include ‘jegichagi (a game where you kick a shuttlecock and try and keep it in the air for as long as possible)’, ‘neolitwiggi (a Korean jumping game similar to see-sawing)’, and ‘tuho (a game where people throw sticks into a canister)’. Go out to parks and try ‘yeon-naligi (kite flying)’ as well! 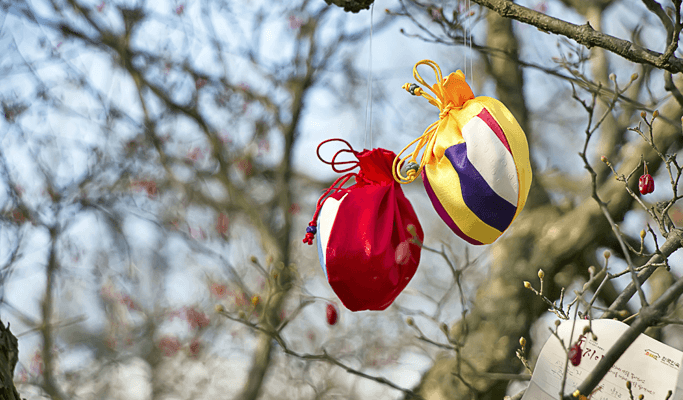 One of the traditional customs carried out on Seollal is hanging ‘bokjumeoni’ or lucky bags on walls or trees. Koreans believe that these beautifully embroidered pockets bring good fortune and bliss to the holder. 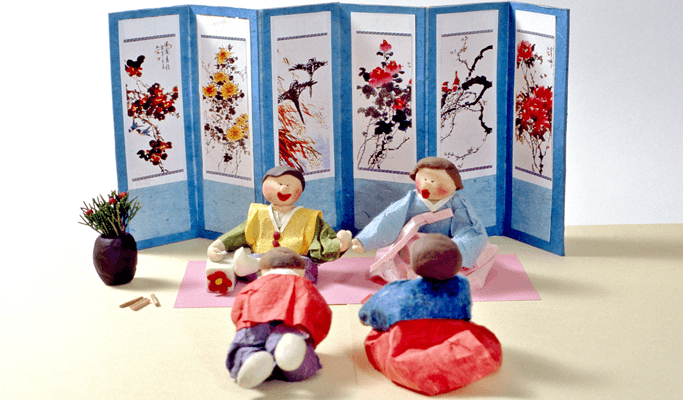 Last but not least, watch this video that shows how Koreans generally spend the Lunar New Year.